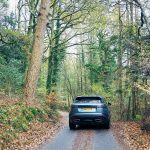 Before the trees had gone bare, when the leaves were on the turn, I went on a fun 48-hour road trip with Land Rover to the Lake District to test drive the Range Rover Velar. 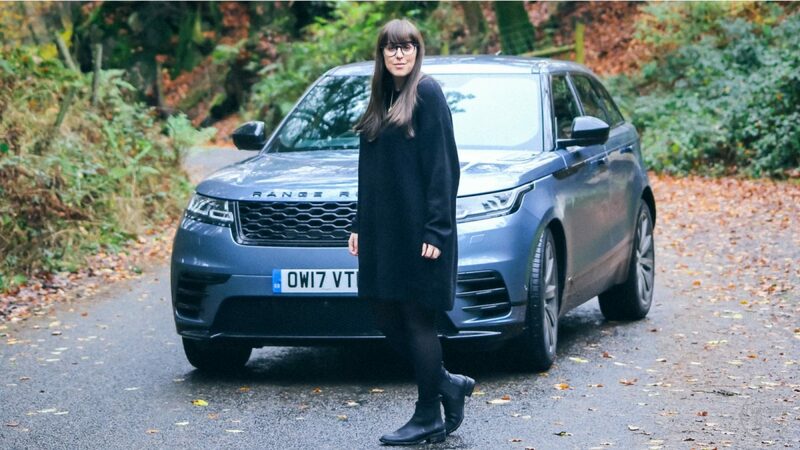 As you guys already know I love my Land Rover Discovery Sport, but this was my first time in a Range Rover and it really is a different experience, to simply say it has a heightened sense of luxury is an understatement, this is one of those uber-desirable cars that once you’ve driven, all other cars will never compare. 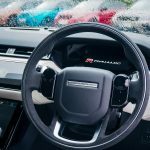 From the moment you open the car, with a push of the button on the remote, the Range Rover Velar oozes luxury, as the door handles pop out from the sleek exterior, only settling back into the car when the doors lock. There are other features to the body of this car that make a statement, I love the grill on the bonnet, the pronounced air vents below the slimline LED lights, the incredible large alloy wheels, the sporty twin chrome exhaust and the roof fin. It really is a beast of a car. 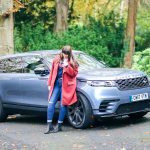 The first thing you notice when driving the Range Rover Velar is the comfort, the seats feel molded to your body, and for a long drive from London up to Ullswater is a dream thanks to the 20-way adjustment and heating, cooling and massage functions. 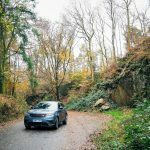 I seriously don’t know how I will go back to a car without massage seats it really creates a calming interior, which in turn means a smooth drive, whether that’s in the city, stuck in traffic on the M25 or nipping down very tight country lanes in the Lake District. The other striking element of the interior has to be the layout, it has a minimalistic order about it, while still having that luxurious feel to it, with everything at a hand’s reach on the T-piece coming down the centre console that’s wrapped in a subtle, plush texture, along with a twin-screen, 10-inch Touch Pro Duo infotainment system, add in the mood lighting, the individual sliding armrest and you’ve really got yourself a luxury interior. 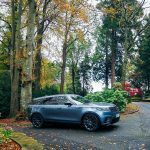 You see, it is where the Range Rover Velar really comes into its own, the way it combines luxury, lifestyle and technology, without being overpowering or complicated, it has this way of making everything seem easy, in someways, like it can drive itself. I loved the way the upper touchscreen featured the navigation, entertainment, phone, as well as a host of other car controls, while the lower screen was dedicated to climate control. Technology doesn’t stop there, as the fanciest addition is where key information such as speed, navigation turns, and safety warnings are projected onto the windscreen as you drive. It takes a little getting used, I think I squealed a little and slightly swerved when I first saw it, but it really is handy, means you can concentrate on the road. It also has a host of other driver assistance systems to make the driving both easier and safer from traffic sign recognition, lane departure warning, cruise control, even autonomous emergency braking, and my favourite, and most useful, the adaptive driving beam that uses a forward-facing camera to detect on-coming traffic and automatically dips your full beam. I’m telling you this is the best invention ever, I don’t know about you but I always find the lights lever a little too far away from the steering wheel and so turning on and off full beam myself is so frustrating. The finish to the interior is also gorgeous, of course it features the traditional luxury leather, which is the norm for luxury cars like this, however, Land Rover have also introduced a premium textile with Danish technical fabric specialists Kvadrat that combines a highly durable wool-blend fabric with a technical suede cloth made from recycled materials that will make you think twice about just opting for a leather seat. 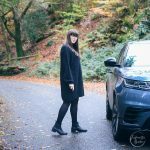 The Land Rover Velar I test drove didn’t have the panoramic roof, others on the press trip did, and it looks so good, if you are buying it is a must-have as it really does let the natural light stream in, even in a rainy, moody looking Lake District. So is it worth the starting price tag of £45k? 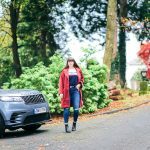 Well, I think so, the Range Rover Velar aims to fill the gap between the Range Rover Evoque and the Range Rover Sport, bigger than the Evoque but smaller than the sport, while still being big enough for a family with a dog, but not too big in the city or tiny Lake District villages like Cartmel, where we stopped for lunch, it can handle off-road, as well as a long journey, lets say a 6-hour drive from London to Ullswater. It’s basically the car to suit all lifestyles. 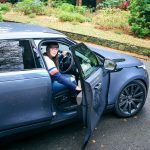 I only got to drive this beauty for two days, but trust me, it doesn’t take long for the Range Rover Velar to make an impact, when you drive it you feel calm, even when you are whizzing around country lanes or stuck in traffic. 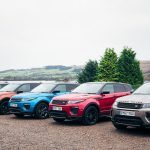 If you give someone a lift you can be guaranteed that they will be wowed, and best of all, it has that stylish appeal that will make it a great long-term investment that you won’t get bored of driving. I’m telling you it was pretty hard giving this beauty back. 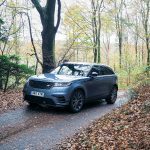 Now, how do I go about trading in my new Discover Sport for the Range Rover Velar? 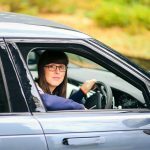 Have you driven a Range Rover before?